Vatican reformers have discovered hundreds of millions of euros that did not appear on the Holy See’s balance sheet, according to Cardinal George Pell, who is charged with sorting out the Curia’s financial affairs, reports The Catholic Herald. Writing exclusively in the first issue of the new Catholic Herald magazine, Cardinal Pell says the discovery means the Vatican’s finances are healthier than they first appeared. “It is important to point out that the Vatican is not broke. 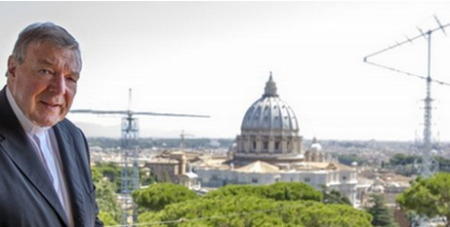 Apart from the pension fund, which needs to be strengthened for the demands on it in 15 or 20 years, the Holy See is paying its way, while possessing substantial assets and investments. Cardinal Pell was appointed Prefect of the newly created Secretariat for the Economy in February, making him the most senior English-speaking official in the Vatican. He explains that reformers had to tackle an ingrained sense of independence among Vatican departments. “I once read that Pope Leo XIII sent an apostolic visitor to Ireland to report on the Catholic Church there,” he writes. “On his return, the Holy Father’s first question was: ‘How did you find the Irish bishops?’ The visitor replied that he could not find any bishops, but only 25 popes.